There are many variables that affect diamond blade performance. 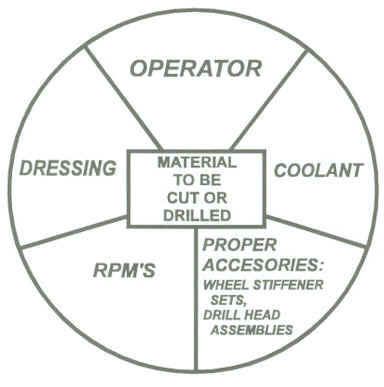 Understanding these variables will help the end user select the right diamond blade specification for their application and optimize their cutting operation to ultimate level of efficiency. The objective of this article is to show the end user that each variable of the diamond sawing process is only one of the many components of a larger diamond sawing system (equation). Changing one component or variable of diamond sawing process cannot create efficiency alone. Only when all components of the system added together can desired outcome be achieved. Just like a mathematic equation, it takes only one incorrectly select variable/component to affect all other properly selected variables. Making the entire diamond sawing equation/system incorrect or inefficient. Many end users approach their diamond sawing application uninformed or misled. Errors are made in the set up phase and critical steps are skipped. When problems do surface, most rush to treat a symptom rather than the cause. Frustration leads them attribute their problems to diamond cutting blade being used. What some customers refer to as serious problem for example, may be resolved by something as simple as changing pressure or direction of coolant flow. The solution can be as easy as changing mounting method, RPM’s, or educating customer about need to dress blade. Selecting the right combination of these variables for a specific material / application is both an art and science that often takes years to master. Information presented in this article is not based on R & D, but primarily on many years of process optimization experience. Each diamond blade application exhibits similar characteristics, whether its in specification or performance. Below is a list of the most important characteristics/parameters obtained from years of experience. 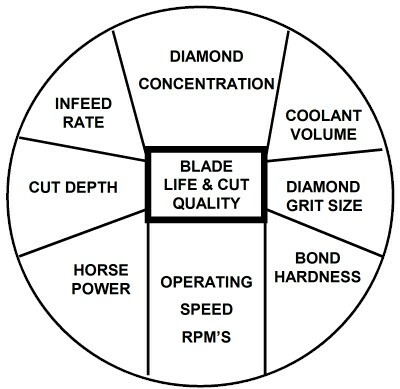 These parameters will play a major role in diamond blade performance. For the diamond blade manufacturer to recommend the right blade for your application. It is critical that the customer provide as much application information as possible. The first step in this process is to consider the properties of the material to be cut and to match diamond blade properties to this material. Table 2 shows a general matching of three basic blade properties to three basic material properties. Common non metallic materials cut with diamond blades vary from hard, dense products like high alumina to loosely bonded, highly abrasive products like concrete block. No attempt is made to list specific diamond mesh sizes, concentrations or bond hardness to cut these materials. This information is to be used just as a guide in selecting diamond blade specifications. Table 2 indicates that hard metal bonds are selected for highly abrasive material. Although physical prosperities are of primary importance in selecting blade properties, chemical properties can also play an important part. With refractory materials, for instance a high alumina content usually indicates that the material will be dense and hard requiring softer bond types and finder diamond mesh sizes. The second step in the blade selection process is to consider the effects of operating conditions on the diamond blade. Table 3 shows these anticipated effects. An operating condition which causes a diamond blade to have shorter life and a faster cutting rate is said to make the blade act softer. A blade with longer life and slower cutting rate is harder acting blade (harder cutting action). Having tentatively selected a combination of blade materials from the material properties guidelines in Table 2 a change in diamond blade materials is made if there is a specific operation condition which will affect diamond blade hardness as shown on Table 3. Initial cost of a diamond blade is primarily dependent on diamond content (concentration). A popular misconception among end users is that diamond content (concentration) and performance are directly proportional. However this is not the cause. In practice, there is an optimum number of diamond particles of a specific diamond mesh size in a specific bond which will produce optimum performance for a specific application. On many applications lower cutting costs are obtained user lower rather than higher diamond concentrations which, in some cases will not cut at all. For this purpose the customer should be concerned with performance, not diamonds. What application parameters are the most significant in making application decisions? In general, the most important factor is the type of material being cut. Manufacturers recommended stock specifications have been developed to cut specific materials under average operating conditions where no specific customer preference has been expressed. For example soft diamond bond, with coarse diamond size and high diamond grade has been found to provide optimum performance on most alumina cutting applications. This specification was developed as a result of many laboratory and field tests of various diamond blade specifications cutting same material. However when this specification does not provide optimum performance, specifications changes are made following the general guidelines presented in Table 2 and Table 3. Except on most common applications, a successful initial blade tests is rare. In many cases it may take several attempts and adjustments on both part of customer and diamond blade manufacturer to come to optimum solution. Blade performance is adjusted by changing blade materials, but it can also be adjusted by changing operating conditions. Information presented in Table 2 and Table 3 implies certain application rules. Table 4 summarizes these rules showing the effect of changing either blade materials or operating conditions, holding all other variable constant. Increasing diamond concentration causes a blade to act harder because there are more diamond particles in contact with the material which reduces the unit pressure per diamond particle and the grain penetration depth. Increase diamond mesh size cause softer blade action because the fewer diamond particles are subjected to higher unit pressures. Increased bond hardness’s make a blade act harder because of increased diamond holding capacity and abrasion resistance. Increase machine operating speeds (RPM’S) make a blade act harder because each diamond particle is in contact with the material being cut for a shorter time period reducing grain penetration and removing less material per diamond particle per blade revolution. Increased infeed rates cause a blade to act softer because the increased unit pressure causes each diamond particle to do more work per blade revolution. Some diamond particles may be prematurely pulled out of the blade because of increased pressure. Increased horsepower causes a blade to break down faster because of premature pull out of diamond particles caused by higher cutting pressures. Stated another way, higher horsepower applications allow the use of harder bonds with hold the diamond particles longer because dull diamond particles cut better at high rather than at low horsepower ratings. Nevertheless there are frequently exceptions. For example beyond optimum point O, blade life decreases with increased concentration. This may occur because the harder acting blades require dressing to maintain a satisfactory cutting action, or increased infeed pressures may have to be used to maintain satisfactory cutting rates. Increased diamond size beyond optimum point O cause a blade to act harder because the coarser particles do not penetrate a very hard material. There is a complex relationship between the number of diamond particles in a blade and the contact area of a single diamond particle. For example a change from 20/30 mesh diamond to 30/40 mesh diamond at the same concentration level provides approximately three times as many diamond particles but reduces the individual particle contact area by approximately one third. It is common to expect harder bonds to produce longer blade life. Other changes in diamond blade materials or operating conditions which make a blade act harder will produce similar effects. Contradictions beyond optimum hardness’s can be explained with similar theories. The accuracy of these theories is not important when considering the blade selection process. Variation is a critical factor which further complicates the blade selection process. 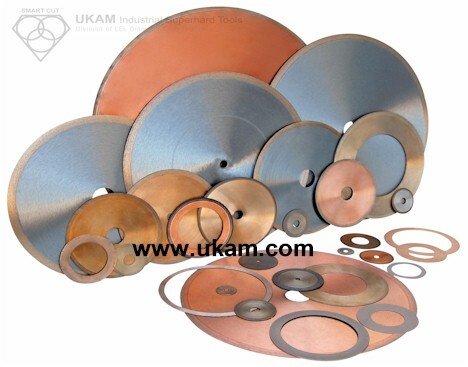 Some degree of variation is fairly common and is to be expected involving most aspects of diamond blade usage, raw material composition, operating conditions and etc. Many factors can affect each of the variables listed above and methods used to control and minimize these variations. Manufacturer of diamond blades goes to great length to control the quality of the diamonds and powders used and to control the processing conditions which affect the performance of the finished product. 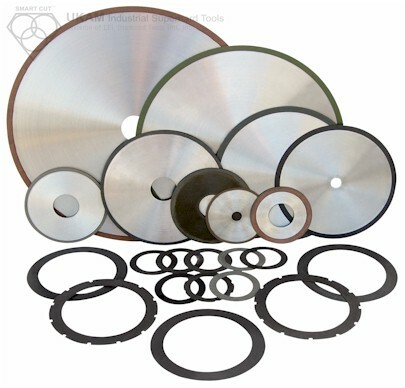 By the same taken raw material manufacturers that supply material that is cut by diamond blades also have formable quality control standards to minimize process and manufacturing variation. Unfortunately the cut ability of these materials is seldom taken into consideration in initial raw material design and process control when designing original product. Refractory products for example are closely controlled for properties such as thermal conductivity, spalling and refractoriness, but cut ability (hardness and abrasiveness) is not specifically controlled. Operating conditions are typically under poorer control than either material properties or diamond blade properties. For instance, the objectivity of the saw operator and the communicativeness of the purchaser are major sources of variations that have important effect on blade performance. Typically the diamond blade manufacturing processes are in far better control than other factors of the application environment in which those diamond blades perform. This normal variation curve represents a hypothetical population of blade performance results on the a specific application. The curve represented by range Rb depicts the relative amount of variation caused by diamond product variables. 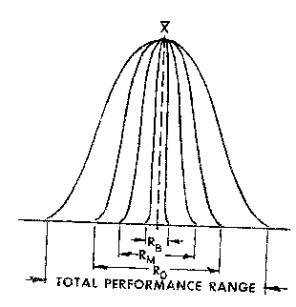 Curve represented by range RM accounts for the amount of variation cause by variables in the material being cut. The range Ro represents the variation in performance results due to variations in operation conditions. The goal in this case is not to relieve the blade manufacturer of the all responsibility of application variations, but it does express the experience of diamond blade manufacturers. One of the most difficult tasks an application engineer faces is solving application problems that are cause by variation. For example, in cutting one material typical blade life is average of 500 cuts per blade is considered normal. Blade represented by point A performed 350 cuts. The user of this blade is not happy and may request a credit. However what the end user should realize is that blade life they have experienced is not out of the ordinary and still falls within the normal distribution curve. When using this particular diamond blade the user was affected by all variables discussed above. Therefore, credit is not really warranted (despite what the customer may feel). This problem occurs frequently and it is the diamond blade manufacturers application engineers task to explain to the disappointed end user that the 350 cut performance level, although low is normal. In these situations, note that blade performance represented by point B is rarely mentioned. 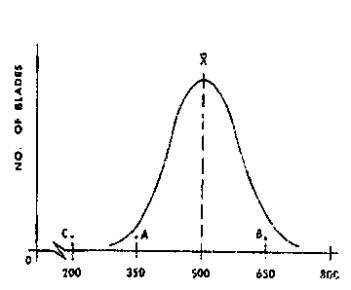 On other hand if a blade provided only 200 cuts as shown in point C, this would be outside the normal distribution curve. There could be more than one explanation to attribute to this poor blade performance. In statistics this performance would be attributed to assignable cause. Finding and assigning cause and correcting the problem behind this poor performance is a challenging task. Most customers logically conclude that there is something wrong with this diamond blade. However, this is not always the case. In this situation it is very important of the customer (end user) and blade manufacturer (supplier) to face these circumstances with an open mind in order to resolve the problem. Both blade manufacturer and user can dramatically benefit by working together to resolve problem, instead of approaching it as advisories. The end users lack of cooperation with blade manufacturer or supplier will be costly to the end user. Important information will be lost unless the end user communicates complete blade application information to manufacturer. The manufacturer can assist the end user by providing important recommendations in changing operation conditions or usage parameters. And in some cases provide different blade specification that will more closely and better match customers application parameters. It’s important for the customer to understand that manufacturers do not rule out diamond blade variability as cause of poor diamond blade performance. Its just very rare. Most diamond blade manufacturers maintain elaborate records documenting diamond blade manufacturing and quality control process at every stage. Each batch and blade produced is frequently assigned as serial number. Every processes underwent in diamond blade manufacturing process can be reexamined and traced to each individual blade. This information is frequently inspected when looking into validity of customer poor blade performance claims. Most customers when experiencing poor blade performance or variation frequently assume the tool used (diamond blade) is at fault. Rarely do these users consider material variations or changes in operating conditions as a factor behind these problems. Rarely does the first blade specification recommended by diamond blade manufacturer provide optimized level of performance desired by customer. Even if by chance the first blade specification tested hits the target, subsequent blades would not perform to most optimized level of performance. This is why results of one blade test are not particularly valid. It is recommended that several blades of same specification by used to establish a average and a range of performance results before adjusting a specification of optimum results. It is therefore in customers best interest to sample as many blade specifications and their variations as possible to establish a precedent (performance benchmark) from which they can measure all other blades. In constructing field tests, the end user should attempt to control operating conditions and material specifications as much as possible to minimize diamond blade performance variation. For this reason laboratory tests utilize statistical methods such as random or multiple blade deigns to minimize the affects all variables that may cause variation, except for those being specifically evaluated. when possible, use automatic cutting equipment which operates at a constant surface speed, infeed pressure and power consumption. If using a human operation becomes necessary, specific amperage levels should be selected and operators cutting technique closely monitored to make sure physical movements are as consistent as possible. material being cut is consistent and carefully controlled. We recommend purchasing large lot of material to represent a total range of variation in cutting properties of that specific material. Doing so will minimize effect of piece to piece variation, when selecting individual pieces at random. In order to minimize material hardness variation, we recommend selecting different places of material and cutting at each different location. when evaluation one or several variables such as diamond mesh size, bond hardness, concentration, and etc in same test, select specific blade specification combination at random. By selecting random sequent in which only a few cuts are made with each combination of variables and then another random sequence selected. This is important to minimize variation cause by factors such as operator fatigue, weather conditions, power sources variations and machine condition changes. The customer stands much to gain by following proper diamond blade testing procedures. Frequently customers ask the manufacturer to make certain predictions about diamond blade performance. Questions such as “How many cuts will this blade make?” are frequently asked. Unfortunately, there is not real answer to this question. Because it takes a considerable amount of time and patience to explain all of possible variations behind diamond blade performance. One customer may achieve certain blade life or chipping level on specific application. While another customer may experience longer or shorter life on exact same material and application. Even though operating condition and materials appear to be relative same. Any estimate from blade manufacturer may be interpreted by customer as a commitment or statement of performance guarantee. This is unrealistic and discourages for objective testing, the results of which will benefit both customer and manufacturer.